The leading model among the Breitling collections, the Chronomat 44 reflects a universe dedicated to performance, sporting feats and surpassing personal limits. The sturdy Steel polished case housing Manufacture Breitling Caliber 01 boasts water resistance to a depth of 500 m (1,650 ft). 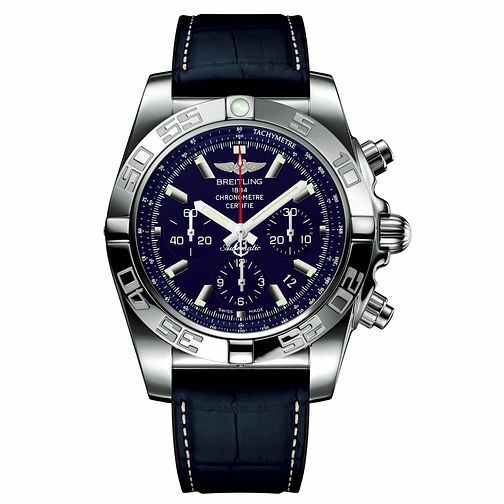 The dial is Blue Mother-Of-Pearl which, along with the all-steel chronograph, the unidirectional, ratched bezel and the Crocodile blue rubber strap, makes a powerful and unique instrument for aviators and divers.